The Google Doc that I used this year as a Reno/Tahoe Odyssey team captain worked so well, I thought I'd share it with anyone who's interested. Here's the link to the Reno/Tahoe Odysey Template. There are five main parts to the template. The first sheet is an instruction sheet for people who may happen upon the template without seeing this post. It can be deleted if you're comfortable using the template without it. After you get your team registered, you'll need to get everybody's legs assigned. 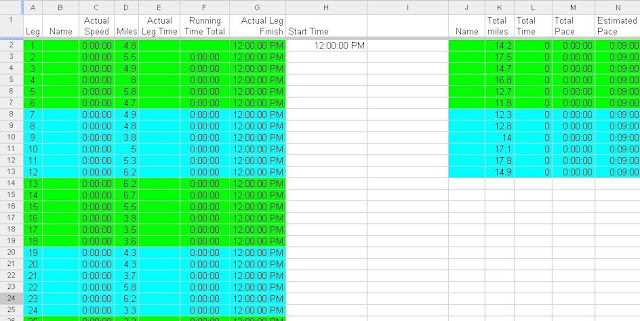 Once this is done, you can plug the team members names and predicted paces into the Predicted Times sheet. 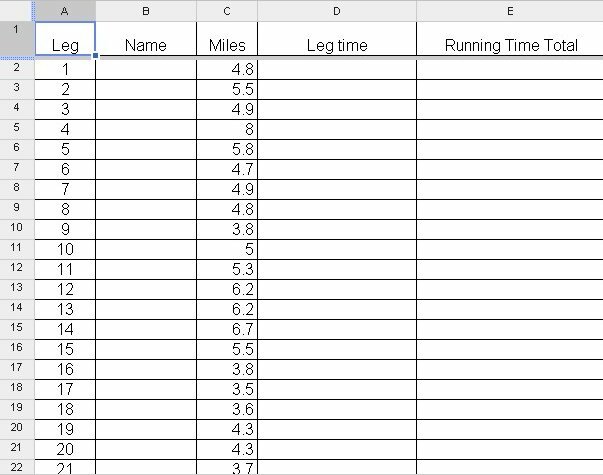 This will calculate for you how long each leg should take, and what the overall time for your team should be. Once you get your actual start time, you can input that at the top right of the sheet, and you'll see about what times of day each leg should start and finish. 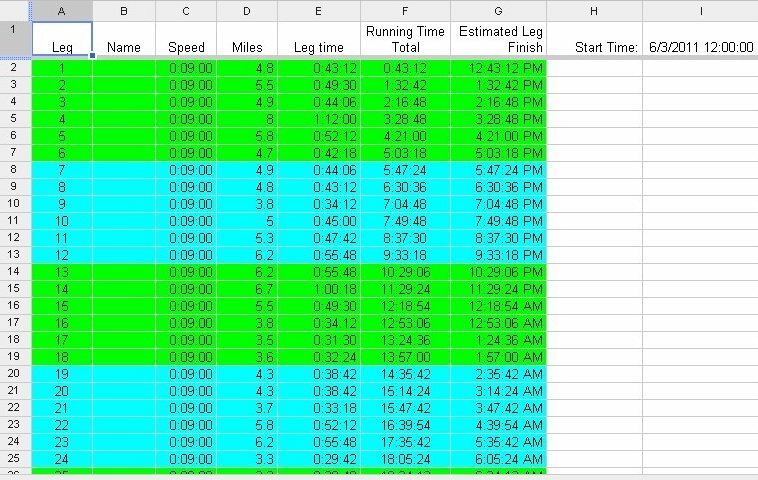 Of course, these can vary during the actual running of the race, but this is a nice sheet to print out and have along to see how you're doing against your predicted times. This year, at the captains meeting and packet pick-up, they asked for a list of cell phone numbers for at least two people in each van. 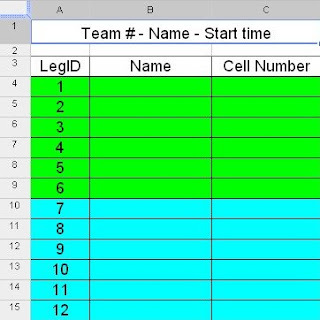 Easy enough to use the Phone List sheet for this - just copy and paste the data over from the Team Info sheet. After you rest up a little, hop back onto the spreadsheet and go to the Actual Time sheet. Enter all the leg times, and it will calculate out the paces that were actually run for each leg, as well as cumulative pace for each person's three legs. Hope this helps, and that people get some use out of it. 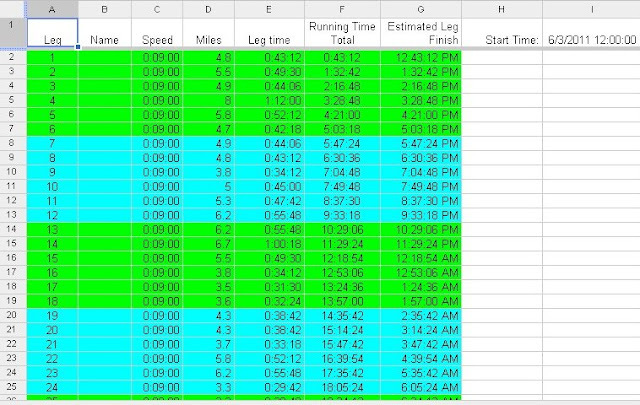 Of course, simply by changing the leg mileage, you could easily adapt this for Hood to Coast or a Ragnar relay as well. Let me know if this works for you!